Sometimes we can end up in our comfortable little bubble where we and just about anyone we know enjoy sharing our lives with animals and have compassion for their welfare. Then something comes along that tells us we are a very special group. The animals turn out okay in this story, but the situation gives me a few reminders. This past Saturday I was a vendor at a small local church’s spring Art & Craft Fair. I’d chosen long ago to be outside in a tent, and then this crazy unending winter kept bringing waves of snow and cold with no warm days between. Though the forecast changed daily between cold rain and sunshine the day was beautiful with a perfect temperature. The vendors and customers were all very congenial and everything worked out better than I had hoped. I was tired but happy when it was time to take everything down. Denise, my neighbor with the feral colony at the top of the street, helped me set up, then came back to help me take down. When we were finished we rested from all the carrying and talked for a while at our cars. Everyone else was gone, the neighborhood, surrounded by tree-covered hills and very near the trail where I walk, was quiet as we talked, with two or three cars occasionally passing us by on a two-lane road. And it seemed it had. A small heap was on the road and a male duck was hovering over it. I went in my car to get cardboard or paper to move the duck off the road that had been hit, out of respect and so her mate wouldn’t be hit too. Denise and I ran down to the spot. I stood over the female and reached down with a paper bag to just lift and slide her to the side of the road when I saw that she was still alive and breathing, strong, but rough, and I know that handling any animal of any species that has been injured can make the injury worse and cause more pain. I needed to determine more about it and observe her actions. But the fact she was still alive was almost worse than death on a Saturday evening when no place I could take her was open, and a cell signal wasn’t always good either. Her head was down on the road, her legs underneath, a brush burn on the back of her neck, but her wings and body looked intact, and there was no blood. As cars came toward us I stood on the road behind her and waved them around. The male moved back and forth but didn’t want to come too near me. 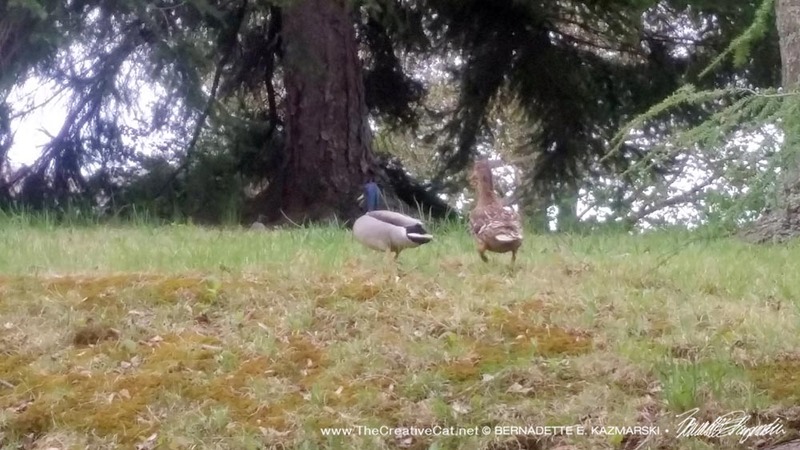 Denise was looking on her phone, two young boys came through a hedge from the yard beyond to see what had happened, and the duck moved her head just a bit. But after I’d waved another car past, I looked down and by some miracle she was standing. Both legs were in good shape, her wings were symmetrical, and she held her head up though her neck was still bent. And shortly after that she began to walk, just one short step and then another. I reached down and nudged her to turn sideways toward the edge of the road with my hands gently touching either side of her body. Once she got close to her mate and he called to her, she moved faster and stood next to him. Safe on the side of the road. I hadn’t yet gotten over the fact that she was alive and walking and wanted to continue observing her, but he was in a hurry to get her to safety under some shrubs. She stopped there, but her walking was symmetrical as well, she was articulating her neck and had straightened it out. However the impact had occurred it was likely not a 40mph car hitting her. I had no signal on my phone and the person I wanted to contact was in Messenger; I couldn’t remember my login right then for anything so I couldn’t use Denise’s phone. I knew that the duck had probably suffered physical trauma and was in shock, and might be bleeding internally. I’ve seen some animals, wild and domestic, be hit by cars and get up and look normal and act normal, then collapse a while later, so I wanted to observe as long as possible. Over the next half hour or so she walked around with her mate, up and down little hills and up toward the church. 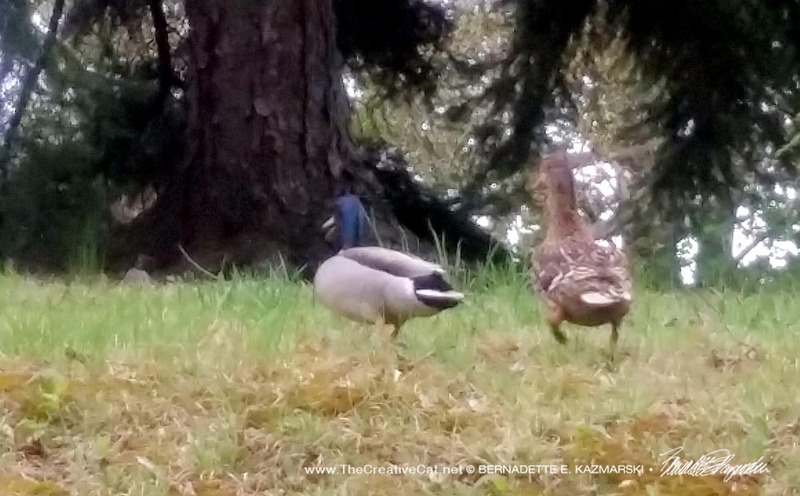 I knew there was a pond with a variety of ducks who were fed and monitored by everyone around—the Duck Pond had been part of the community practically since the pond had been part of the farm that was on that spot. The road to the pond was near the spot she was hit and one block down, and likely the ducks walked all over the place, including up to the church where the grounds were quiet and usually unoccupied. They two ducks may even have been displaced by our event that day. 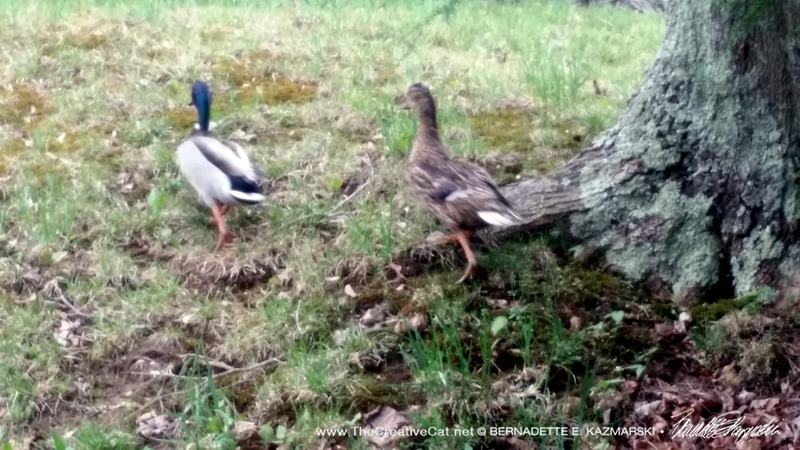 They walked up toward the church and under a spruce next to an overgrown driveway. The male continued out from under the spruce, grazing as he went, but the female remained standing under a low branch. Denise and I both looked at her and saw that she was just standing, looking out. This was the moment, I thought, she’s going to start to fall apart. The male went back to her and patiently stood near. The slight movement of her sides with her breathing seemed normal. No doubt she was experiencing pain and needed to rest, but perhaps she wasn’t hurt badly enough to need treatment. Walking to the top of the hill. I finally got a signal and sent a message to my contact, but my battery was at 12%. Denise and I decided to leave so I could use my computer and recharge my phone and I could come back to check before dark. We unpacked my things from Denise’s car and I saw that I had a message from my contact. We messaged for a half hour or so, I sent the photos I’d taken of them walking, and she said she thought the female’s posture looked pretty good, certainly no sign of concussion. I went back then, but found no trace of them anywhere. The female would blend right in with pine needles, leaf litter and twigs, and even the male with his gray sides and glossy green head and neck among all the fresh grass and new leaves, but his white necklace would show up even at night. If she had continued walking I guessed she was okay enough to stay there, certainly better than me trying to get her into a carrier and taking her somewhere, if I found anywhere to take her. 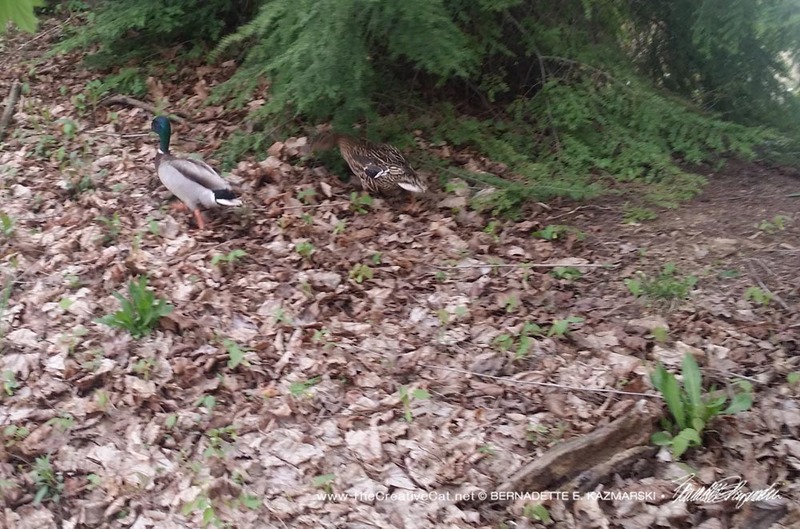 I emailed the person I knew at the church who said ducks did nest around the church grounds and she would take a look, and a friend who lived down the street and attended that church as well. It’s a little bit of a helpless feeling to not really be able to help. I’m not convinced she was okay after the loud thwack of an impact I heard. With their lightweight bones and fragile feathers birds always seem delicate and easily hurt. But maybe there’s more to them than I know. When situations like this come up with wildlife, I am always frustrated when doing the right thing—getting care for an animal in need—is often not possible. This duck might have been only stunned by flying into a car, but standing over her on the road, knowing she was still alive and might be acutely suffering, knowing there was very little I could do for her at that moment points out a failure in our ability to be kind to animals. Wild animals suffering from the effects of our society, usually after a collision of some sort with a vehicle, is so frequent there should be some sort of protocol for care, and if so, more people might do more for them, and feel a bond of compassion for wild animals. Instead, many suffer. This happens with pets as well, though in recent years we have many more options for them. But in many cases it’s not pets hit by cars but abandoned, abused, or trapped in a situation with poor or no care who need the help. Knowing someone’s cat is not spayed and constantly producing kittens, horribly cruel hoarding situations, dogs chained up outside for their entire lives, though laws in some places will help, in most cases there is nothing we can do when we encounter it, and I feel just as helpless looking at those animals as I did looking at the injured female mallard on the street at my feet. But because finding help is difficult doesn’t get us off the hook. If we turn our compassion toward all animals we will find a way to help, however small, and expressing the need to have help available in situations like this will eventually help make change. And small steps, each day, toward improving the lives of animals add up to a journey for our society. My experience with the ducks is coincidental to Be Kind to Animals Week, but we can still help animals every day. What a great story. We have to believe that the duck was all right and just grazed. So glad you stayed there and that she got up and walked away. I really hope so, Margie. I just know that any one of those cars who went around me would have just hit her, not knowing what she was, or not caring. B, you CARED, and if the duck could speak, she would have said thank you. A co worker of mine and I felt as helpless last summer when I spotted an injured red tail hawk on company grounds. three hours later we were assured by raptor rescue, that not many would have stayed with him that long, until proper help arrived, but neither myself or my co worker could have just “left work” and left him to fend for himself. Thank you for helping the red tail! Rescue takes time, all sorts of time, and that’s what most people least want to give.